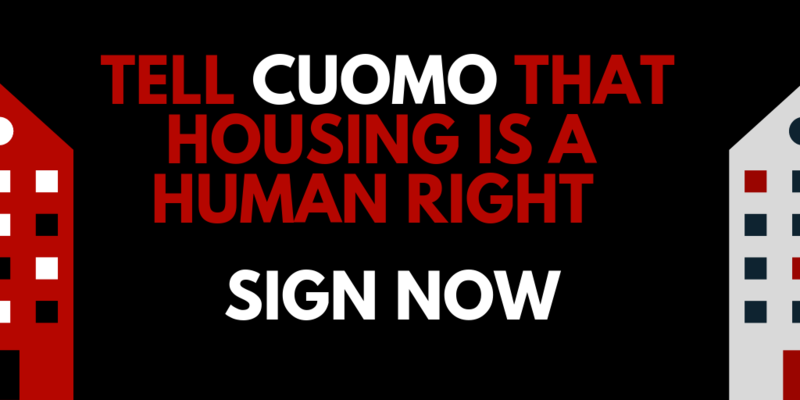 You may receive updates from Upstate/Downstate Housing Alliance, New York Communities for Change (NYCC), Daily Kos, Citizen Action of New York, and Upper West Side MoveOn/Indivisible Action Group, the sponsors of this petition. Stand with Tenants and Help Us Make History! Everyone in New York knows the rent is too damn high, but no one is doing anything about it. This year, that can change. And if it doesn’t, it will be too late for the millions of New Yorkers who make up the fabric of New York State. More than 8 million New Yorkers rent their homes, but the vast majority of tenants have no protections against landlord harassment, price gouging, retaliation from their landlords, or eviction. As a result, 92,000 people are homeless. This is a crisis that was created in Albany as a result of the corrupt influence of the real estate industry on State politics. It’s gotten worse in the last 10 years, and unless something changes right now, it will be too late. Across all of New York State, rent is going up way faster than incomes, and too many people can’t afford their rent. From Brooklyn to Buffalo, 100 people are evicted each day. This year, State legislators have a chance to do something about it. For the first time in decades, we can renew, strengthen, and expand rent control in New York State. It’s time for the powers that be in Albany to finally decide whose side they are on: the people who elected them, or landlords who have profited hand over fist for decades. Tenants, not landlords, are the real constituents of New York State. And New York tenants can’t wait. The rental housing crisis is a STATEWIDE crisis. 100 people are evicted each day. As tenants, many of us experience landlord harassment, unfair rent increases, and eviction. The growing crisis we face was created in Albany by weak or nonexistent tenants’ rights that have left us vulnerable to harm and abuse by landlords, corporate property owners, and the real-estate industry. You can stop this. The best way to make life better for New York’s tenants is to fix the broken rent stabilization system in Albany that comes up for renewal in June. These laws must be strengthened and expanded to protect all tenants. This year, special treatment for the real-estate elite must end. The majority of New Yorkers—millions of us—are tenants, not landlords. We are the real constituents of state government. Yet year after year, housing policy in Albany has worked to serve the real estate industry and has undermined tenants’ real needs. In just a few weeks, our rights as tenants will expire all together. There are no more excuses. You can choose to stand with tenants right now, or you can let landlords continue to rule New York City. We need stronger, fairer, and better rent regulations that protect all tenants. We need to stop enabling and enticing the landlord class to earn bigger profits by harming us. We need #UniversalRentControl. In June, you have a clear decision to make: protect the nearly 8 million New Yorkers who rent their homes, or continue to give special treatment to the landlords, corporations, and real-estate firms that own rental properties in New York State.